Eating, giving presents and having fun are all part of this time of year so I am urging everyone to think about the environment and make recycling part of their new year’s resolution list. In the UK this xmas we are expecting to see an extra three million tonnes of waste from food and drink packaging, Christmas trees, Christmas cards and maybe even a few unwanted presents. All this waste has to go somewhere and if it is not recycled most of this district’s rubbish will end up in the Welbeck landfill site near Normanton. Statistics from the national "Recycle Now" campaign show that one billion Christmas cards could end up in bins, most Christmas trees will be thrown away generating over 160,000 tonnes of additional rubbish - 21 times the weight of the Eiffel tower. Nationally an extra 750 million bottles and 500 million drink cans will also be used and most of these will just be thrown away. To help reduce this and make the district a better place to live in, I am asking you to think about our 4 'R's, Reduce, Reuse, Recycle, Repair and also to compost your garden waste. 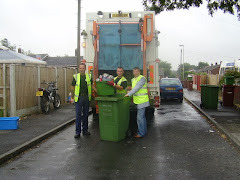 Do your bit by: Recycling cans, plastic bottles, paper, cardboard and glass bottles as part of your bin collections or at one of Wakefields 62 mini recycling centres or one of your local Household Waste Recycling Centres. Make a New Year’s resolution to recycle more waste, more often or better still, try to reduce, reuse or compost your waste.